I also cannot run the sticks in dual channel, it either won't start or it will run and only have 4GB usable (how I'm running now). The other case is if I run them in single channel than it MAY run with 8GB but then I might get a spontaneous system freeze and then the system just runs the fans until I shut it down and shuffle around my RAM sticks...it's getting pretty damn frustrating though. I guess it COULD be the memory controller in the CPU going bad, but how can one even test that, I'd want to know if my parts are safe to sell when/if I upgrade to another platform...though given what I've looked into, I strongly believe it's just this stupid motherboard's problem and nothing damaged. Thoughts guys? Thanks in advance! Bump your memory controller voltage. I run 12GB on an MSI Big Bang board and have to run upwards of 1.4v on the memory controller and have had to since I put 12GB in the system 3 years ago. Most likely you will need to run 3X2GB for stability @ 1600MHz,.. you could try 3X4GB @ 1333MHs or 1066MHz. with your memory controller running 2GB modules 1333MHz @ voltage/timings listed on module in 3X2 or 6X2,.. is best configuration for stability regardless of voltage applied. 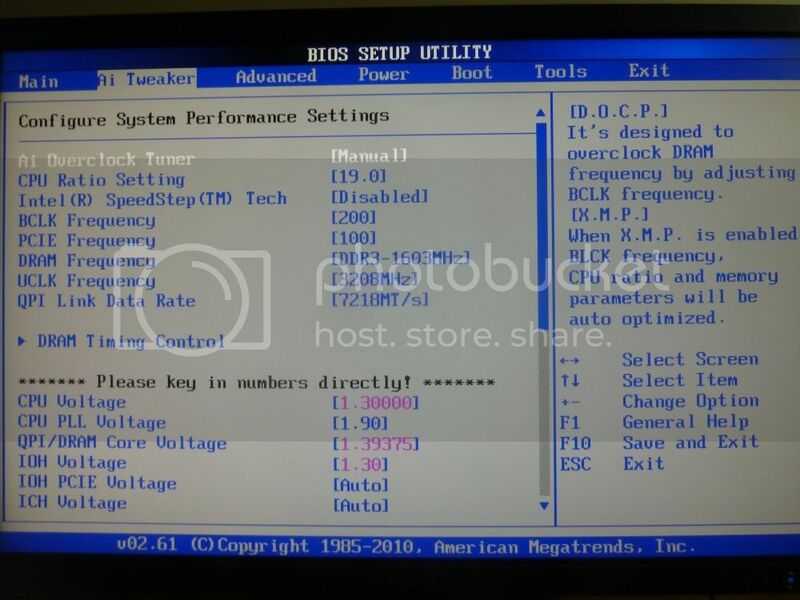 could it be that, the bios is remembering settings from the OCZ sticks, and some how screwing up the sizes because of it? 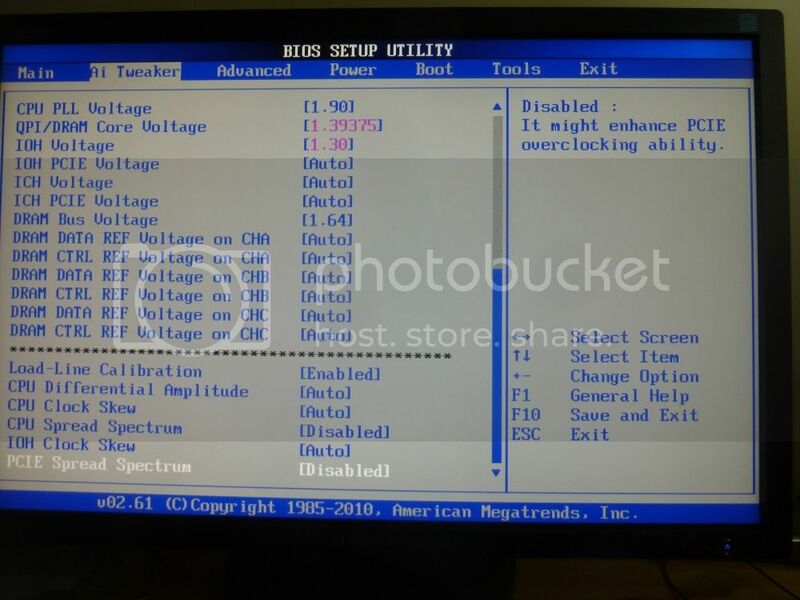 Can you completely reset the bios? If you want to borrow a XEON E5520 to test with the P6T Deluxe, let me know. Remember, you want to keep the CPU Voltage within 0.5V's of the Memory Voltage. So if your Memory Voltage is 1.65V's, you want to have your CPU Voltage at least 1.15V's. No problem. The XEON is just sitting around. I'd probably at the most get $30 for it, but it's much better served as a backup CPU for 3 people I know still running x58 motherboards (and I still have 3 systems with x58's still). I had this same issue with an EVGA board when trying to run 6, 2 gig sticks. Never did figure out why but had heard it was an issue with the memory controllers on the chip. I switched it to three four gig sticks of lower voltage memory and haven't had an issue since. 1. Set PLL Voltage to 1.8V. 1.9V seems too much, 1.8 should be fine. 2. Set ICH Voltage to 1.10V. I don't know why you'd need 1.30V. 3. Set your QPI Link Data Rate to the lowest if it's not. 4. CPU Ratio of 21 and BCLK to 180. This will set your RAM to 1443MHz. Keep your timings the same. Set your UCLK Frequency to 2887MHz.